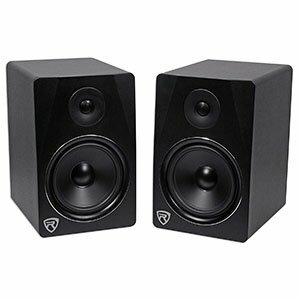 Compared to a set of $100 monitors, those found in this price range are considered to be the first true speakers of this type. This is where you will find the sweet-spot deals in the entry level class. We’ve selected some of the best monitors you can grab for less than $200, which have a proven track record. Those trying to put together a decent home studio with a somewhat sensible budget will find some pretty decent solutions in this segment of the market. As a matter of fact, some of the best monitors on the market can be found here. Even though Rockville APM8W are still within the budget range, they offer an incredible performance that punches way above the intended weight class. We have a pair of speakers which feature great cabinet design, good materials and a fairly solid build quality. On top of that, Rocville’s aesthetics are on point as well. Speaking of which, you can choose between white, black and classic wood. When you look into the hardware and performance, things get even better. Rockville went with a 1″ dome tweeter and a 8″ low frequency transducer per each speaker. In terms of power, the pair is capable of delivering 500 Watts. I/O cluster also includes some surprises, such as the USB port in addition to the RCA and XLR/TRS pair. 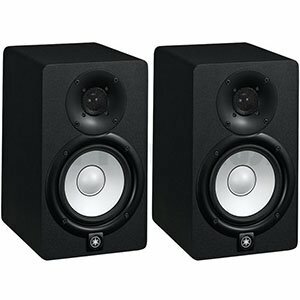 Yamaha made quite an impact on the market when they released their HS series of monitor speakers. The reason for this is the fact that HS5 we are looking at today, has proven itself quite competitive in a very short amount of time. The speaker features a simple design with cabinets that come in either all black or all white. In terms of hardware, you have a 1″ dome tweeter paired with a 5″ low frequency driver. You can recognize HS series speakers simply by looking at the LF driver. Their white color has become a trademark of sorts. Each cabinet is bi-amped and pushes 70 Watts of power, making the whole set capable of 140 Watts in total. For the money, these are great. 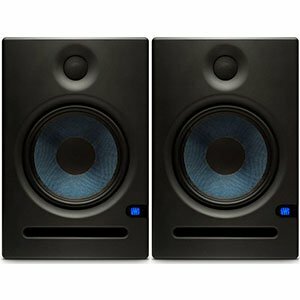 Speaking of successful budget monitors, we can’t forget about PreSonus Eris E4.5. This entire series of speakers has proven its worth numerous times by now. Eris E4.5 is known for its quality build, simple aesthetics and great performance. These have proven to be especially formidable when you need something compact. With front facing controls, you are look at great ease of use. Under the hood, we see a 4.5″ Kevlar low frequency driver and a 1″ low mass silk dome tweeter. Each cabinet is rated at 25 Watts of power thanks to the quality Class A/B amp. If you look at the back plate of the active unit, you’ll see extensive acoustic controls as well as a versatile I/O cluster. Overall, a great package. Behringer has always been the go-to brand when it comes to affordable audio gear. They may not be the best out there, but they’re hard to beat when it comes to bang for the buck value. Behringer Studio 50USB follows that policy quite nicely. We have a simple, compact pair of cabinets which blend into any environment. However, the hardware is where things get interesting. Each speaker packs a 1″ silk dome tweeter along with a 5″ low frequency driver. On top of that, each speaker is bi-amped, maxing out at 50 Watts of power. In other words, a pair of these will give you 100 Watts of rather transparent performance. The I/O cluster includes your standard XLR and TRS ports but also a USB port. 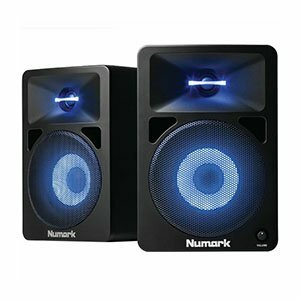 If you’re looking for something different, Numark N-Wave 580L may be right up your alley. Before we get to hardware and performance, we have to address the fact that N-Wave 580L features some insane aesthetics. Both the tweeter and the LF driver are illuminated by a set of LEDs. This gives the speakers a rather unique appearance. On top of that, you can change colors. From a performance point of view, things are looking pretty good. We have a 1″ tweeter paired with a 5.25″ low frequency driver. The quality of sound’s more than acceptable and rather transparent all things considered. Both cabs together push out some 40 Watts of power, which makes them fairly decent for for the money. Overall, N-Wave 580L are different to say the least. 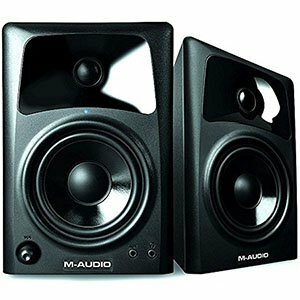 After experiencing a great success with their AV32 line of monitor speakers, M-Audio did what every other brand would in their situation and scaled up the design. M-Audio AV42 represent a beefier alternative with its larger drivers. Interestingly enough, these share the same design solutions as the model they were based upon. For the most part, that is a good thing. AV42 features a 1″ low mass dome tweeter sitting in a rather efficient weave guide. Low frequencies are taken care of by a 4″ low frequency driver which adds more precision in the lower frequency range. A pair of AV42 is capable of delivering some 40 Watts ensured by their Class A/B amplifier. Last but not least, the I/O cluster is fairly versatile. Alesis Elevate 5 MkII have proven to be one of the more interesting options in the lower mid range. Aside from a fairly simple design, these speakers offer a number of efficient solutions. If you need an example, just take a look at front bass reflex ports. By doing this, Alesis has allowed the user to push these closer to a wall if necessary. The hardware comprises of a 4″ low frequency driver, a 1″ silk dome tweeter and a Class A/B amp which pushes 40 Watts per channel. When you add front facing controls, a decent I/O cluster and a fairly transparent sound, you end up with a great platform aimed at beginners and those who need a bit more versatility on a budget. What Kind Of Performance Can You Expect From $200 Monitors? 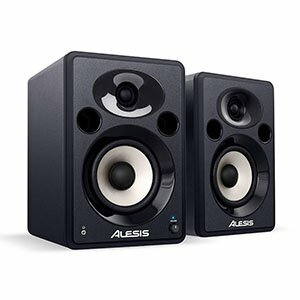 Most of the music production community will regard the monitors found in the $200 category to be well within the entry level segment. With that said, the difference in features and performance compared to $100 price range is significant, to say the least. The first thing you will notice are larger drivers. For the most part, a 5″ unit is going to be the standard bar some exceptions. However, the pure increase in driver size isn’t what makes this segment of the market so attractive. The real improvement comes in features most of these speakers bring to the table. We are talking acoustic controls, various attenuation options and more. This is where you are already entering the true monitoring territory. Being able to adapt the output and profile of the speakers to match your room, is pretty important. While all of most of these monitors belong to the near or midfield section, having some options is definitely a good thing. On top of that, pure performance is also improved. In general, you can count on more even response across the frequency range. This gives you the much-needed transparency. Sure, a $500 set of monitors is still going to be much better at just about everything, but a lot of people consider the $200 and maybe $300 range to be the true sweet spot. At least that is the case for those who are looking for the best bang for the buck. Similarly, a lot of brands like to include more advanced I/O options in this particular category as well. Compatibility with various standards is a thing that becomes more important as you develop your setup past your computer. Are you absolutely going to use some of these inputs and outputs? That is something which depends on yourambition, but it is always great to have at least some kind of a choice available. Transparency is what defines how good any pair of monitor speakers are. Of course, that isn’t the only metric used, but transparency sure is the most important one. The question that many are asking when shopping for monitors in this price range, is whether or not transparency is any better compared to more affordable models? The answer is almost always a strong yes. If you around, chances are that you will run into a large number of producers who consider $200 monitors to be the bare minimum for any kind of serious work. Although affordable models have a very real purpose, this claim has quite a b it of support in practice. Brands are not only installing better hardware but they are also dedicating more of their efforts to pushing that hardware to its limits. If you are wondering whether or not to get a $200 set of monitors, rest assured that your investment will pay off multiple times. We have already mentioned that I/O clusters on speakers in this price range tend to be more diverse and versatile. Being able to understand what these additional I/O options mean can help you choose a set of monitors to best fit your current and future needs. There are several types of connections used these days in the world of audio equipment. You will find your XLR, TRS and RCA connectors. These three are the golden standard for anything ranging from mics to amps. In other words, having all three or two out of these three will allow you to connect your speakers to a variety of mixers or any other gear imaginable. Here is where we reach the actual question that will simplify the whole I/O discussion. How serious are you about music production? Just by being here with us and reading this short guide should mean that you are at least interested in the subject matter. If you plan on producing music as a hobby or semi professionally, having a more diverse I/O cluster can only benefit you. Especially when you start expanding your list of equipment, which you inevitably will at some point. The least thing we would like to discuss are upgrade paths. If you look at the average speaker in this price range, you will find that most of them come with 4.5″ or 5″ low frequency drivers. While that driver size works for representing lower frequencies, it isn’t necessarily optimal. This is why some of the models on our list come with built in upgrade paths. To be more specific, you are getting subwoofer support should you decide that the bass is just not up to the task. Keep in mind that accentuated bass isn’t really preferred during mixing, but it is also true that a well defined bass that reaches low into the frequency range can allow you to hear details you otherwise wouldn’t be able to. 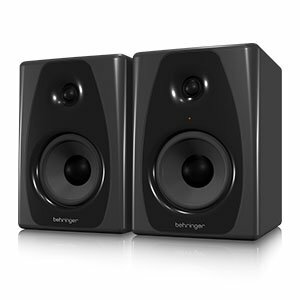 Finding the best monitor speaker under $200 isn’t an easy thing to do, but it is much easier than finding a good set that is cheaper. Models listed above are by far some of the best in this category. With that said, this price range still requires you to accept some compromises here or there. Being able to recognize what your priorities are can be fairly helpful in narrowing down the choices. If you are on a budget and that budget extends to $200, you should be in a fairly comfortable position. Deciding to save for a more expensive set is totally understandable, sticking with something from this price range is a good way to go.